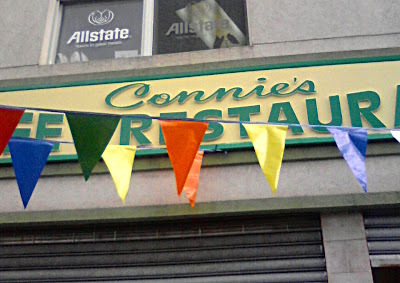 Kensington, Brooklyn: Signs of life at Connie's. As you've probably all seen, Church Avenue Restaurant Cafe has become Connie's Cafe Restaurant and they had their Grand Opening yesterday. I spoke with Connie this evening, and she is starting with a standard diner menu, using all fresh ingredients. Each day she will have 6 specials and she plans to have a Sunday brunch menu as well. The hours, to start, will be 6 am - 6 pm. She understands the need for evening hours and plans to expand hours in a few months. The restaurant has a bright and inviting new paint job. Once she gets the permits, she plans to have outdoor seating on the E 5th St side of the building as well. Please come and support this much appreciated newcomer to the slowly expanding Kensington-Windsor Terrace dining scene. Connie has lived in this neighborhood her whole life, and looks forward to meeting everyone, and hearing suggestions from her neighbors. Other reports indicate that Connie is interested in possibly hosting some live music as well, which most people would find welcome. Personally, we'll be happy if the coffee and soup aren't cold, like some other cafe's in the area whose names rhyme with "Baroque Candy Virus." Connie's is located on the corner of Church Avenue and E. 5th Street.